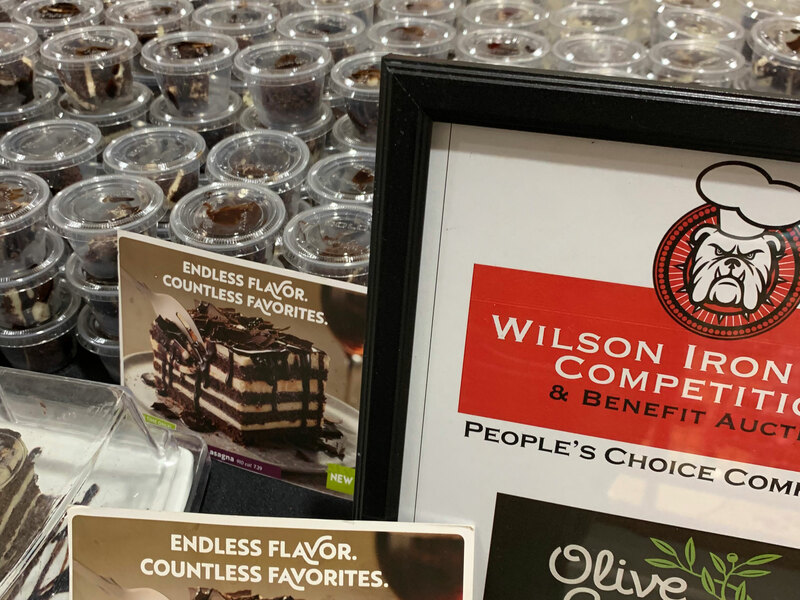 The sixth annual Wilson Iron Chef competition was held on March 24, and Berks County Eats was there to get a taste of the best Berks County has to offer. There’s a lot to bite into so we are splitting this into two posts. In today’s part one, we recap the People’s Choice competition and vendor row. This year’s People’s Choice competition may have been my favorite to date. It was also the hardest to choose a winner because of the stiff competition among the eight participating restaurants. 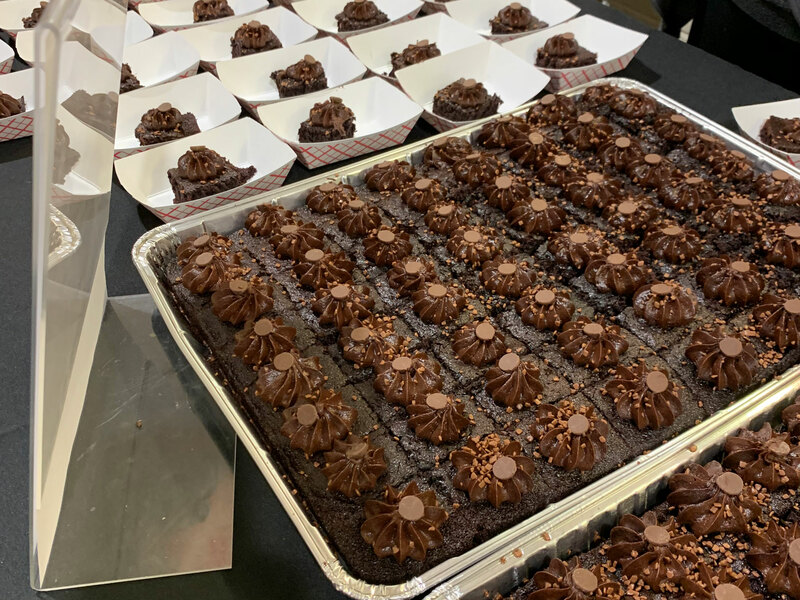 Every chef had to create their best dish using one common ingredient: cocoa. And the participating chefs were able to create some amazing dishes. 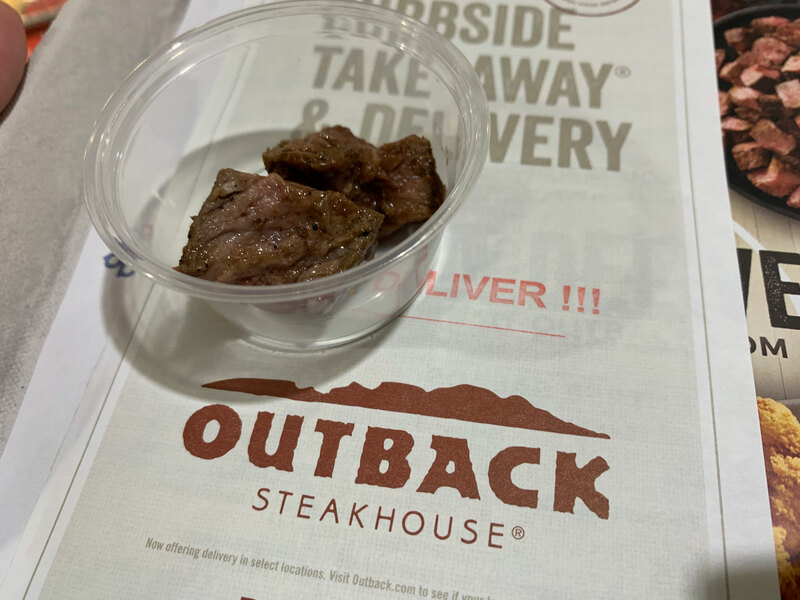 The only real disappointment in the group was Outback Steakhouse which delivered a seasoned steak that may or may not have actually had chocolate. This is not a knock on Outback Steakhouse – Bloomin’ Onions are a guilty pleasure – but compared to the other offerings, it was uninspired. One place that had an inspiring dish, and placed runner-up for their efforts, was Still Playin’ Distillery, a yet-to-open restaurant and distillery in Orwigsburg, Schuylkill County. 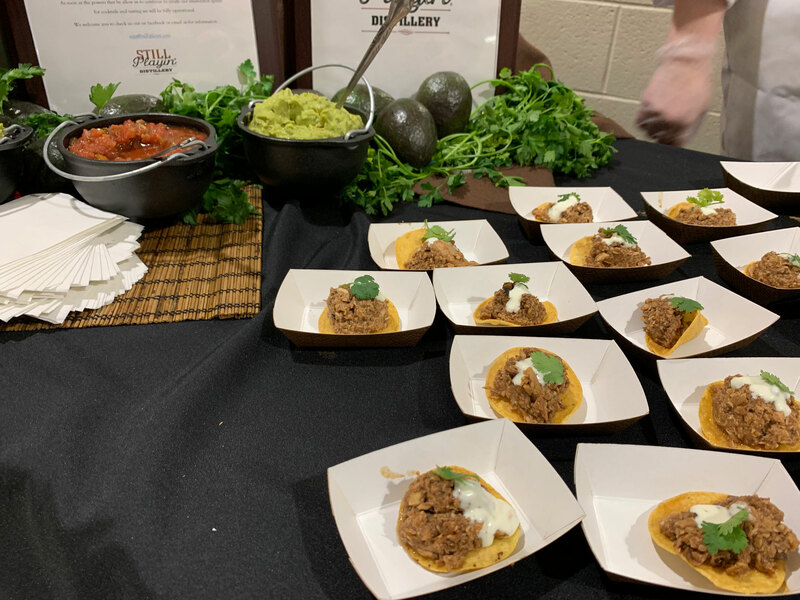 The chef brought a fantastic chicken mole that earned its distinction as one of the best items in the competition. 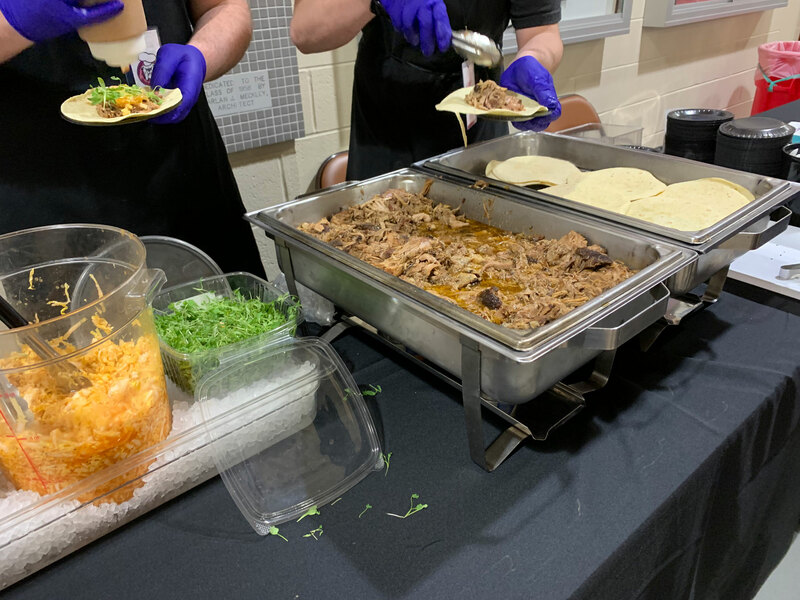 Building 24 and the Works at Wyomissing also went with a Mexican-inspired dish, a cocoa-rubbed smoked pork taco. I didn’t get as much of the chocolate as I had hoped and I thought it could use a little queso fresco or other cheese to really bring it together. They did add a “pot de creme,” a chocolate custard with cocoa nibs that I loved. One more South-of-the-Border offering came from Gourmand. 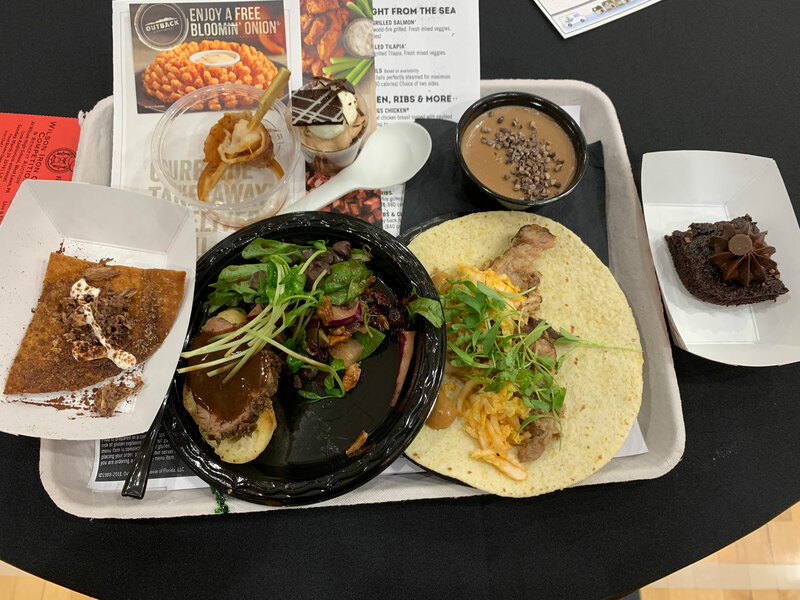 Theirs was described as “Dark Chocolate Aztec Chicken with Habanero Creme Fraiche on a Fried Cinnamon Tostada.” It was right up there with some of the best dishes of the competition and probably would have received my vote if the creme fraiche had a little more kick to it. Gourmand also tried to bribe with desserts, this one being their chocolate black-out cake. (Note: bribing people with desserts is perfectly acceptable behavior). Olive Garden only brought dessert. It was the restaurant’s chocolate lasagna (a three-layer chocolate cake) and a taste of cannoli. Another stand-out for me was the Crowne Plaza. Their chef prepared steak and salad with a chocolate sauce atop the steak and dark chocolate morsels in the salad. I loved the salad as the chocolate and balsamic combination was spot-on and I thought the sweet and savory combo of the entree was very well done also. It didn’t hurt that they sweetened the deal with a chocolate mousse from their Pastry Studio. Say Cheese may have had the most original creation: a sweet cocoa eggplant caponata over chocolate bread. 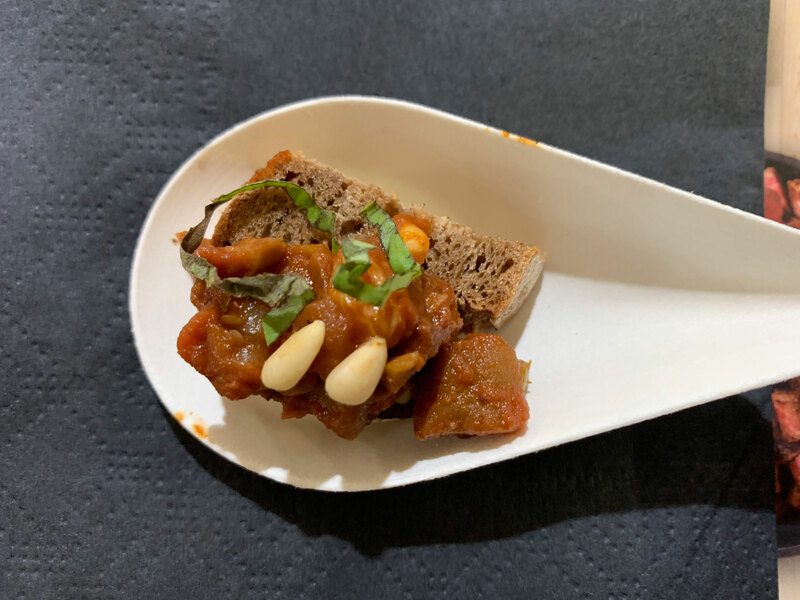 I had never tried caponata before, but it was a very good sweet-and-sour mixture. And the chocolate bread was very good as well. 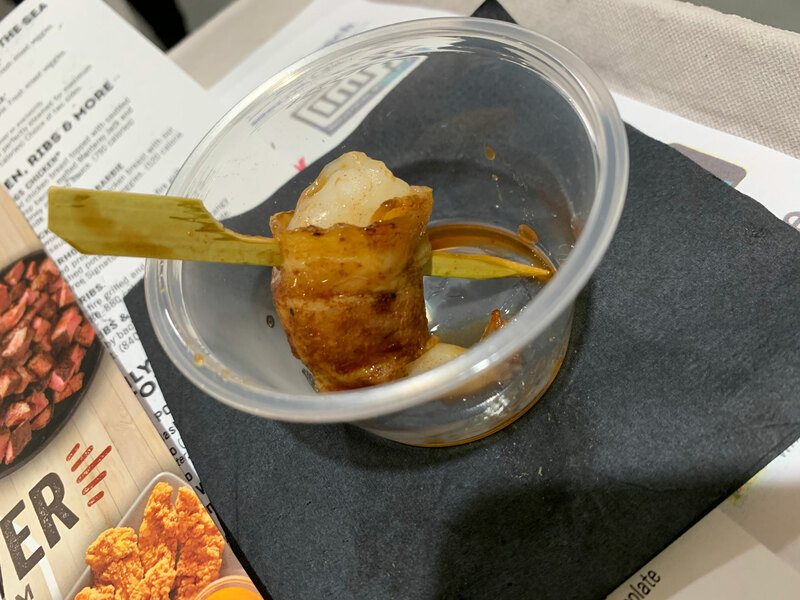 Last but not least, defending Iron Chef champion Chef Mike Martino from Adelphia Seafood brought shrimp wrapped in mocha-rubbed bacon. I’m admittedly not a seafood fan so it wasn’t my favorite, but it was the crowd’s favorite as Adelphia Seafood earned the People’s Choice Award for 2019. 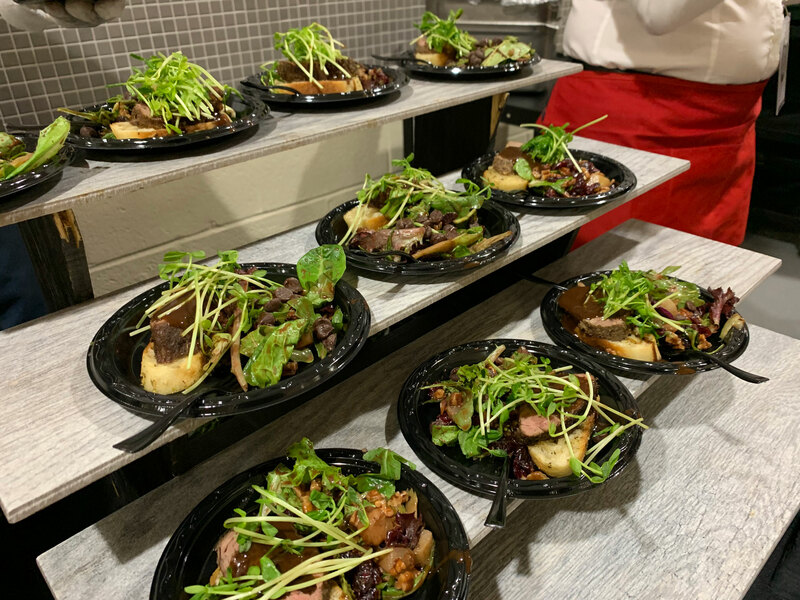 Because the eight People’s Choice entrees weren’t enough, vendor row featured another 25 vendors offering everything from popcorn to cake pops and bone broth to lobster bisque. 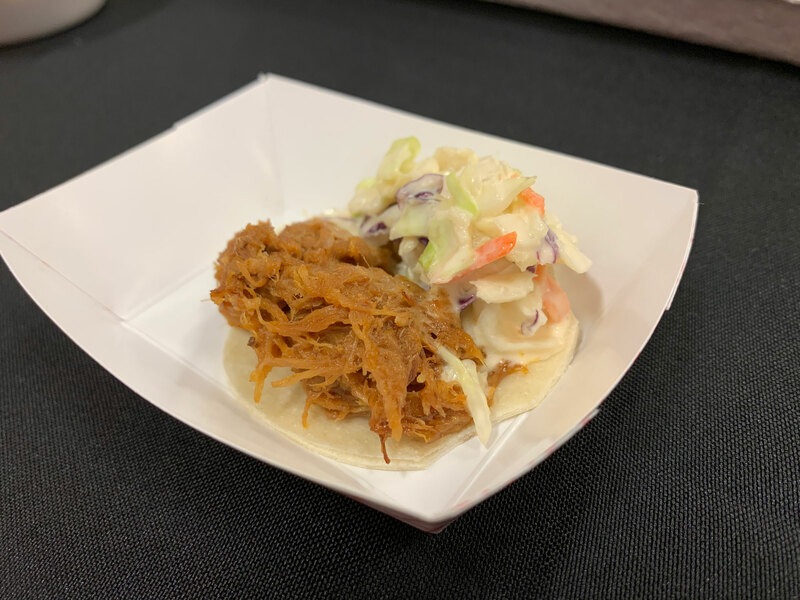 A highlight every year for me is the Station House Grille‘s pulled pork taco sliders (they also brought mac and cheese this year). I am a big fan of the little restaurant in Tuckerton, especially their pulled pork and coleslaw. One lowlight, and I hate to point these out, was Mikura. 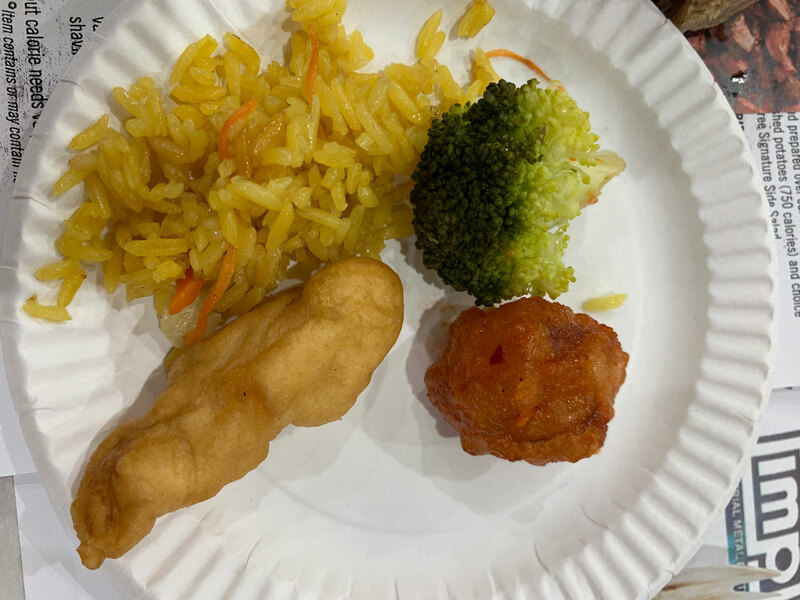 While I love their food, the General Tso’s chicken was cold and the sweet and sour chicken was served with no sweet and sour sauce (which, by definition, makes it just chicken). Sometimes food doesn’t travel well, and that seemed to be the case here. If there were an award for the most beautiful display, it would go to Catering by John Lowe. 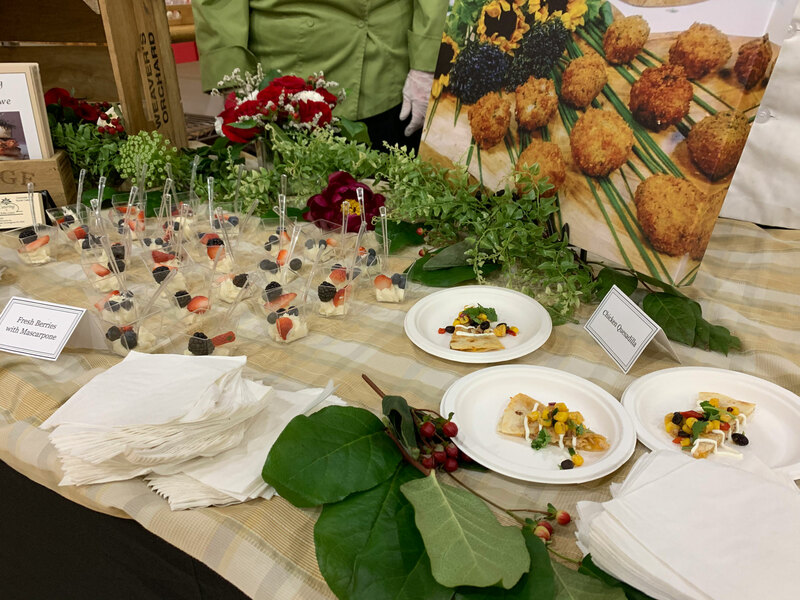 Chicken quesadillas and fresh berries with mascarpone were accented by flowers and berries and a rustic wooden crate. The food was pretty darn good, too. The sweets kept coming on vendor row, too. 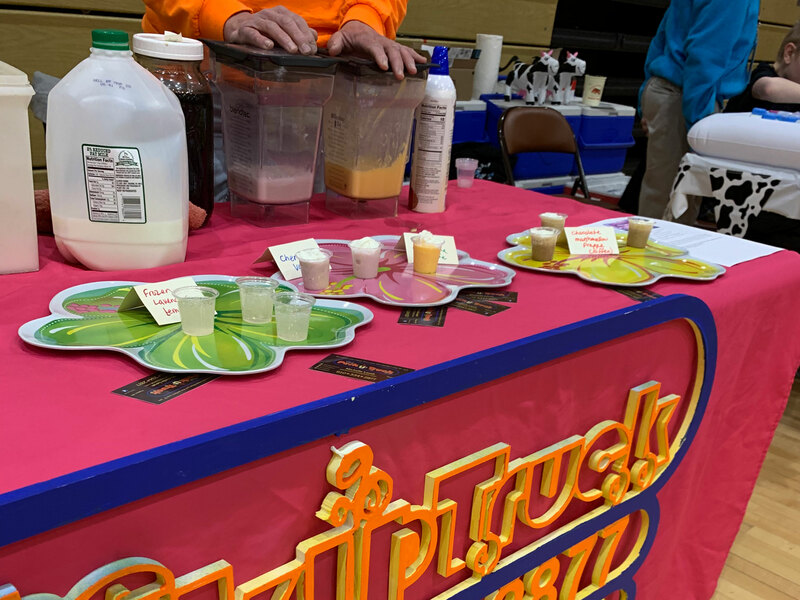 The Perk Up Truck was there with smoothie and juice samples, including the orange creamsicle that I love so much. And Sweet Ride brought the ice cream cart with six flavors, including the intriguing pomegranate blueberry chunk, peanut butter weave and cookies and cream. 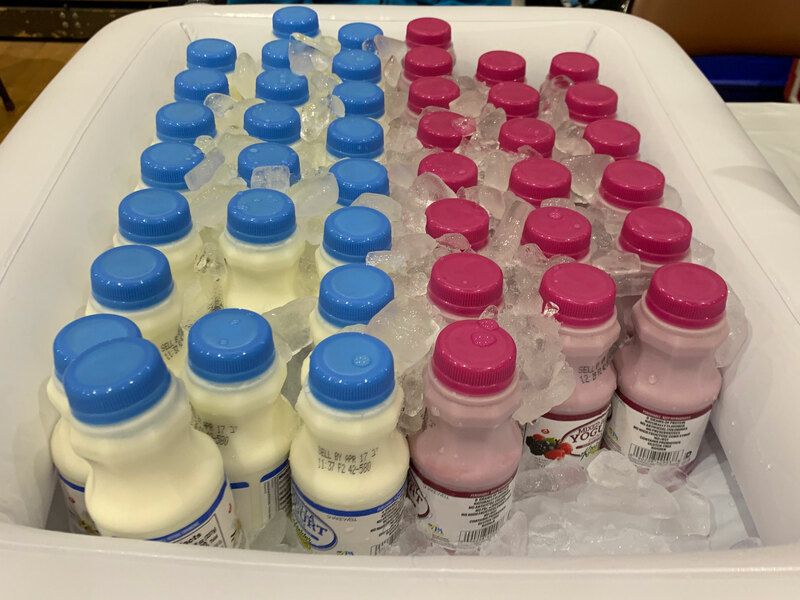 Long-time vendor Doorstop Dairy was there with an expanded product line. I always enjoy a cup of chocolate milk from them, but this year they brought drinkable yogurt from Kreider Farms. I had the mixed berry and once I got past the fact that it was yogurt and not milk, it was enjoyable. 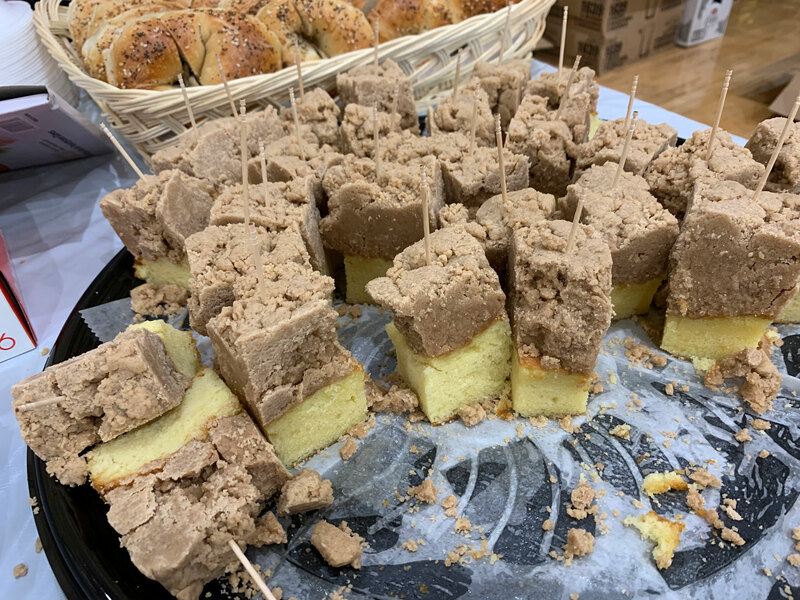 In addition to bagels, the New York Bagelry brought their famous crumb cake. It’s famous for being about two-thirds crumbs and one -third cake, which I think is exactly the right proportions. Life, like crumb cake, requires balance. So after all of the indulgences, I ended with a stop at Good Life Organics and a taste of some better-for-me foods. 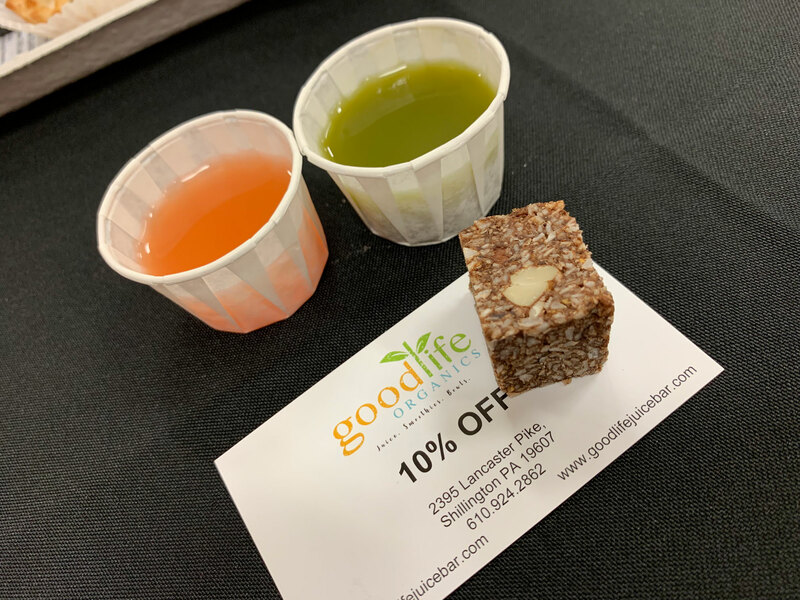 That included kombucha (it’s an acquired taste that I still haven’t acquired), some great juice and a chocolate-coconut morsel that was excellent. Unfortunately my stomach’s limitations forced me to skip over a few stands, including PJ Whelihan’s, Brickstone’s Mighty Fine Food & Spirits, Pilsudski Mustard/Betty’s, and Morabito Baking Company, to name a few. 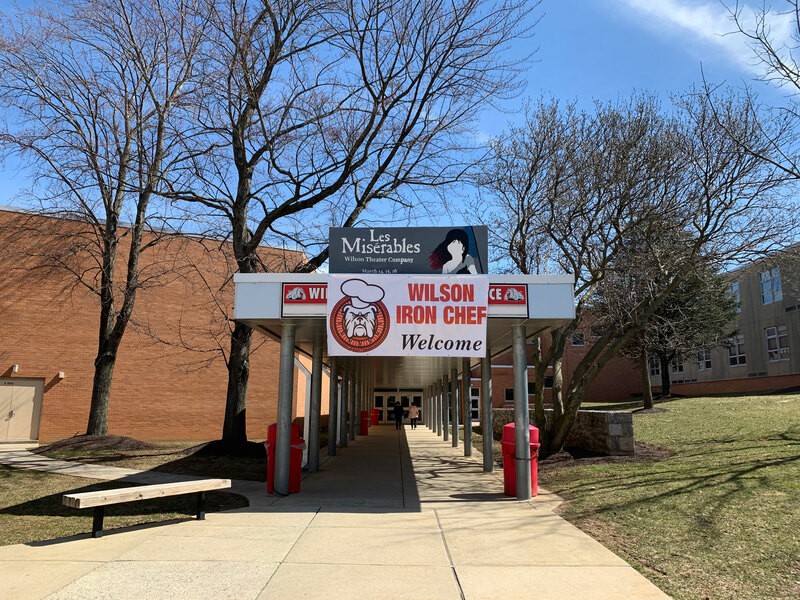 Coming tomorrow, we will take a look at the 2019 Iron Chef competition, as I saw it (and tasted it) from the judge’s seat.